We don't go to Tulsa often enough. The city is chock-full of routie goodness for Route 66 aficionados like ourselves, and there's plenty of fine architecture and signage off the route too. Decent food also abounds in Tulsa. 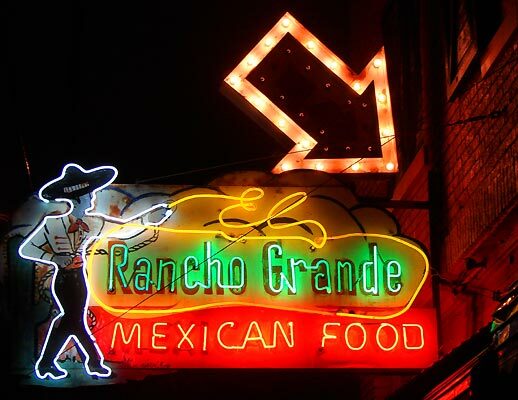 My lovely significant other was in the mood for Mexican and I wanted to see the Rancho Grande sign at night so it was our choice. I'd first noticed the sign last June when I drove by just as they were maintaining it. We headed to the Expo Square Pavilion to catch the last of a basketball game. 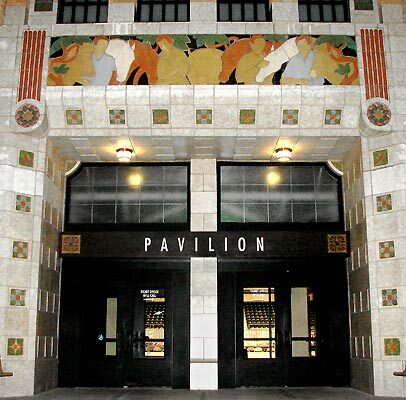 The pavilion, part of the Tulsa fairgrounds, was built in 1937 and renovated in 2001. The building features beautiful decorations outside, which are echoed inside - the top picture of this post is one of the inside panels. Here's one of the panels behind a Tulsa player who would really like an opposing player to not get the ball. 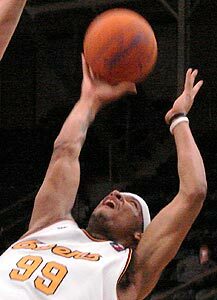 Why was I - not a sports fan - interested in a basketball game? 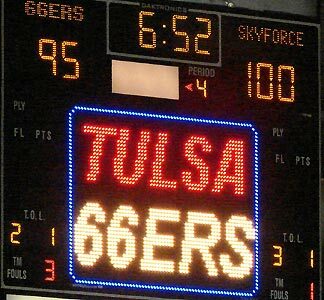 Well, the team name, the "Tulsa 66ers" was inspired by Tulsa being a Route 66 city. 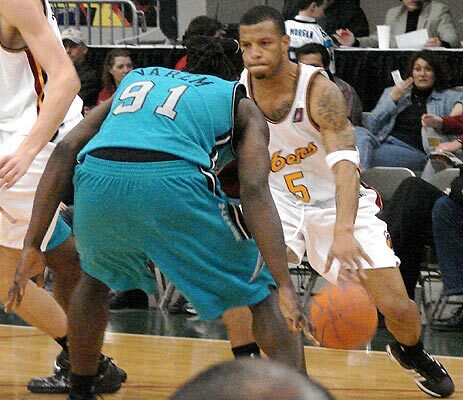 It should be noted that the fairgrounds is about a half-mile from Rt66 and the team was only formed in 2005. 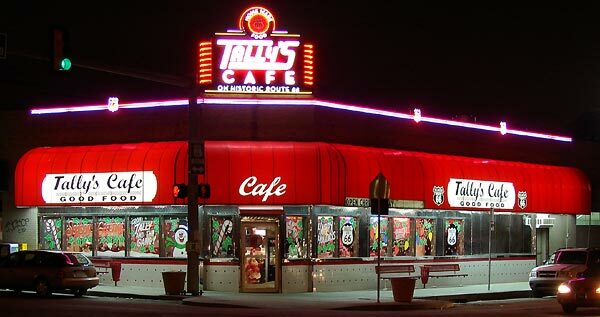 There's no history here, and I suppose the naming of the team could be yet another case of something being hitched to the current 66 bandwagon, but in any case, I suppose the name does serve to increase awareness of Tulsa's Route 66 heritage. 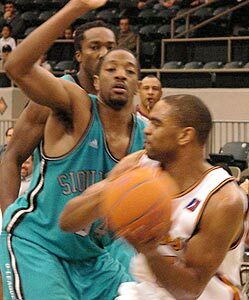 This night, January 5, the 66ers played - and lost to - the Sioux Falls (SD) Sky Force. 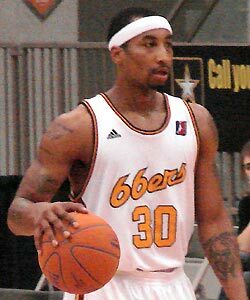 The 66ers are an NBA "D-team." 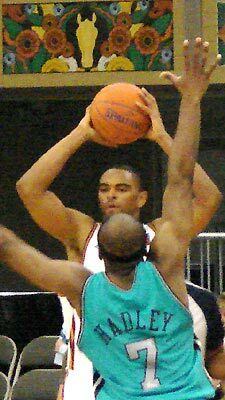 As near as I can tell, the NBA uses such development teams as a training ground for players who are not quite ready to be on mainstream NBA teams. 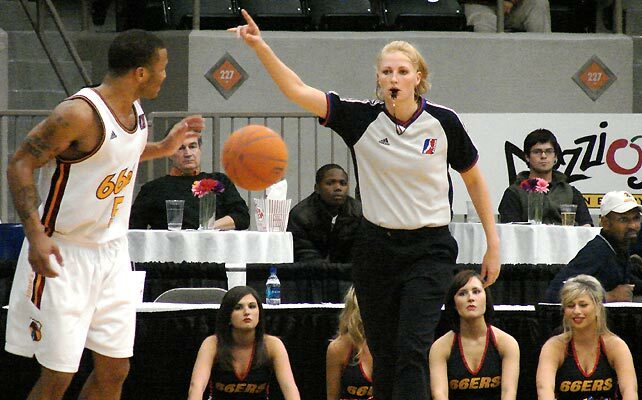 I am told that the NBA also uses such teams to try out new ideas, like female referees. 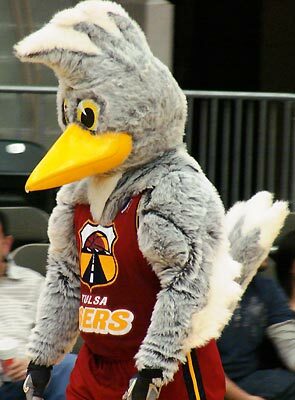 The 66ers mascot is "Routie", a reference to fans of Route 66. 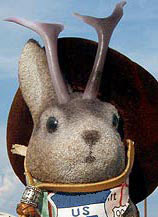 Routie the roadrunner is not the first team mascot Ace has investigated. 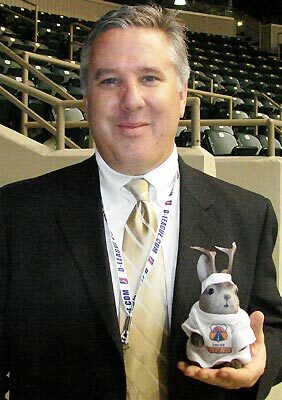 In this photo with Routie, you can see the 66ers shield logo on Ace's shirt. Ace met team president Joe Berry. Of course, the oft-tattooed players and a man dressed as a bird are not the only attractions in the pavilion. The team's cheerleaders are the lady 66ers. If I read the program correctly, this is Candace (left) and Jenni. 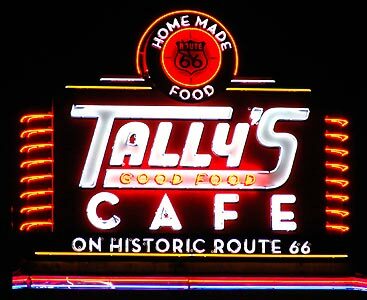 After the game, we drove up Yale Avenue to 11th Street so we could take Route 66 out of town, At the corner of 11th and Yale is Tally's Good Food. We've stopped there before, but not this time. This retaining wall on the south side of 11th Street, just east of Yale Avenue, pays tribute to the street's Route 66 heritage. 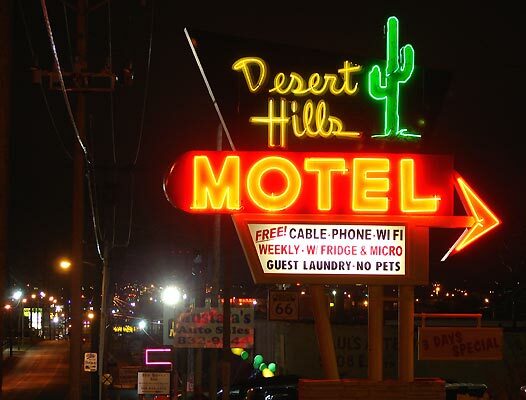 Moving on east, I've never stayed at the classic Desert Hills Motel, but I've heard good things about it. I've photographed the sign, along with many is Tulsa, in previous years but it's easier (and more current) to shoot it anew than it is to find all my old paper prints and scan them. That ribbon of pavement to the left is route 66, 11th Street in Tulsa. 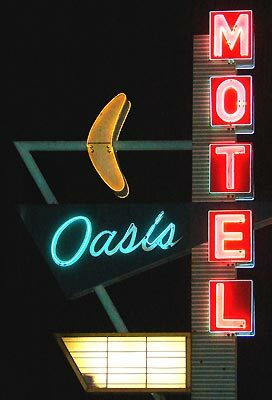 On our way out of town, we stopped to photograph my favorite Tulsa sign, the boomeranged bit of neon googie goodness that marks the Oasis Motel in east Tulsa. We continued east on I-44 after Tulsa. At Big Cabin we stopped to check out Standing Brave, a huge roadside statue that appeared early in the millennium to grace our roadside-junkie lives. 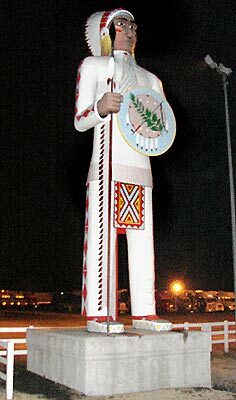 As the four-state area of Missouri, Oklahoma, Kansas and Arkansas is almost devoid of roadside giants, we welcomed the addition to our landscape. Standing Brave's job, aside from amusing me, is to promote a truck stop and a common type of Oklahoma business: a smoke shop. It's been a long time since we've noted any of the rules Ace lives by, but rule #22 is "Always stop to investigate a giant anything." 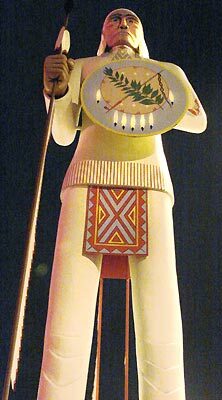 In this case, "giant" would mean, according to Roadside America, 46 feet tall on a five-foot pedestal for a total height of 51 feet. We checked out the accompanying convenience store and restaurant for any clothes or accessories Ace could use, but found none. We've generally had a good track record of this, having found enough Indian accoutrements in tourist traps out west to assemble a fine Indian costume. 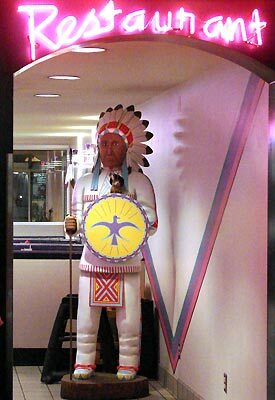 We did, however find this man-sized version of Standing Brave in the restaurant. 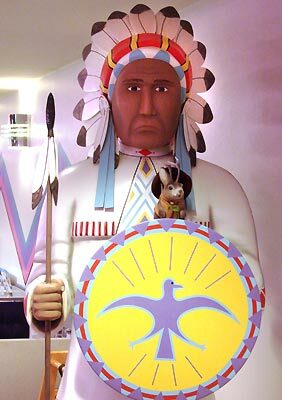 An addendum to rule #22 is apparently: "always pose with a replica of a giant anything." Mmm... North Pole Flavor Country!